To really listen to others, say David Rome and Hope Martin, we must first learn to listen to ourselves. They teach us three techniques for tuning in to body, speech, and mind. If we are to survive in the twenty-first century we must become better communicators, speaking and listening honestly and compassionately across diversity and difference. Unsatisfying communication is rampant in our society: in relationships between spouses, parents, and children, among neighbors and co-workers, in civic and political life, and between nations, religions, and ethnicities. Can we change such deeply ingrained cultural patterns? Is it possible to bring about a shift in the modes of communication that dominate our society? Contemplative practices, with their committed cultivation of self-awareness and compassion, may offer the best hope for transforming these dysfunctional and damaging social habits. A fruitful place to begin work on shifting our patterns of communication is with the quality of our listening. Just as we now understand the importance of regular exercise for good health, we need to exercise and strengthen our ability as listeners. Poor listeners, underdeveloped listeners, are frequently unable to separate their own needs and interests from those of others. Everything they hear comes with an automatic bias: How does this affect me? What can I say next to get things my way? Poor listeners are more likely to interrupt: either they have already jumped to conclusions about what you are saying, or it is just of no interest to them. They attend to the surface of the words rather than listening for what is “between the lines.” When they speak, they are typically in one of two modes. Either they are “downloading”—regurgitating information and pre-formed opinions—or they are in debate mode, waiting for the first sign that you don’t think like them so they can jump in to set you straight. Good listening, by contrast, means giving open-minded, genuinely interested attention to others, allowing yourself the time and space to fully absorb what they say. It seeks not just the surface meaning but where the speaker is “coming from”—what purpose, interest, or need is motivating their speech. Good listening encourages others to feel heard and to speak more openly and honestly. Trust here does not imply agreement, but the trust that whatever others say, regardless of how well or poorly it is said, comes from something true in their experience. Our approach to Deep Listening focuses first and foremost on self-awareness as the ground for listening and communicating well with others. This may seem paradoxical—paying more attention to ourselves in order to better communicate with others—but without some clarity in our relationship to ourselves, we will have a hard time improving our relationships with others. A clouded mirror cannot reflect accurately. We cannot perceive, receive, or interact authentically with others unless our self-relationship is authentic. Likewise, until we are true friends with ourselves, it will be hard to be genuine friends with others. Deep Listening is a way of being in the world that is sensitive to all facets of our experience—external, internal, and contextual (body, mind, and speech). It involves listening to parts we frequently are deaf to. In order to balance and integrate body, mind, and speech Deep Listening teaches three different but complementary contemplative disciplines: mindfulness–awareness meditation to clarify and deepen mental functioning; the Alexander Technique to cultivate awareness of the body and its subtle messages; and Focusing, a technique developed by psychologist and philosopher Eugene Gendlin that utilizes “felt-sensing” to explore feelings and nurture intuitive knowing. In sitting meditation practice, sometimes called peaceful abiding, we learn to settle, returning over and over again to the present moment and allowing our thoughts to come and go without acting on them. In the process, we see how our self-absorption keeps us from experiencing the world directly. Letting go of the “web of me” is the first step toward seeing and hearing others more fully. In our Deep Listening workshops we give basic instruction in sitting meditation, with particular emphasis on being bodily present. Hope draws on her many years of Alexander practice to help each person find a sitting posture that is right for them, gently placing her hands on their shoulders, neck, and back. “Follow my hands,” she will sometimes whisper, encouraging students to let their body respond without deliberate effort by letting go of habitual patterns and freeing itself into ease and balance. Mindfulness–awareness practice is a way of fundamentally making friends with ourselves, based on an attitude of gentle, non-reactive noticing. This attitude is the key to success not only in sitting meditation, but equally in Alexander work and Focusing. Meditation helps us to develop equanimity and not be pushed and pulled by our life circumstances. The Alexander technique takes this attitude off the cushion and into our lives. Our way of perceiving and responding to our world has a physical shape and quality. Generally that shape consists of either slumping or holding ourselves too rigidly in “good posture.” Either way, we are interfering with our freedom and the life-giving movement of our experience. When we interfere with the free functioning of our systems, our sense of well-being and joy gets blocked, and our experience of the body is one of limited mobility, pain, stiffness, and tension. We are all intrinsically upright, expansive, resilient, and open. Watch any healthy young child and you will see this is true—they are naturally poised and balanced, they move easily, their spines are long, they move on their joints, and they embody a curiosity and interest in the world. They are alive! This is a far cry from the way most adults experience their bodies. But we were children once too, and we can move like that again. The Alexander Technique teaches us to notice the ways we interfere with that kind of joy and freedom. Rather than doing more, we learn to let go of what we’re doing that gets in our way. Because our habits are so entrenched, they are hard to discern. In fact, they feel right to us. For example, someone with lower back pain has no knowledge that they lean way back while standing and moving, thus putting pressure on their lumbar vertebrae. That stance feels perfectly upright to them, and when in an Alexander lesson they are guided to a more balanced upright place, that place initially feels wrong, as if they are falling forward. They can see in the mirror that they are upright, but they don’t feel that way. By becoming intimate with our habits and, in contrast, experiencing the quality of ease and lightness the new place offers, the kinesthetic sense becomes more sensitive and reliable over time. Since kinesthesia provides us with information on our weight, position, and movement in space, it is closely tied with our perception of ourselves and our world. As it becomes more trustworthy, we develop confidence that the feedback we are receiving is sound. We are less prone to interpretation and more in tune with direct experience. This is an essential aspect of skillful listening. Focusing is a contemplative practice drawing from Western philosophy and psychology that cultivates three vital inner skills: self-knowing, caring presence, and intuitive insight. Cultivating these inner skills allows us to bring the wisdom of our whole life experience to bear on solving problems and reaching decisions. The practice of Focusing involves noticing and welcoming felt senses. Felt senses are indistinct sensations that ordinarily lie below the radar of attention, but which can be noticed and felt if we are receptive to them. Felt senses don’t have the clearly defined quality of purely physical sensations like touching a hot stove or stubbing your toe. They are initially quite vague or fuzzy. They are nonconceptual, yet they relate to parts of our lives—work, relationships, fears, creative challenges. They have a quality of “aboutness,” even when we can’t tell specifically what they are about. Occasionally a felt sense shows up that can’t be missed—like having a “knot” in your stomach, a “lump” in your throat, or a “broken” heart. All of these are distinctly felt in the body, and yet are clearly “about” events and situations in our lives. But most felt senses are so subtle that we don’t notice them. They lie below the level of ordinary feelings, but they can be triggers of strong emotion. An episode of anger may be preceded by an inner tightening, a jittery sensation, a sinking feeling. If we can notice these slight inner sensations before we erupt in anger, we gain psychological space in which to choose our words and actions rather than being overtaken by them. It is the difference between reacting and responding. Felt senses function as a kind of borderland between the unconscious and the conscious. Being with felt senses in a patient, friendly way primes the pump of intuition. Although intuition by its nature is spontaneous and can’t be forced, if we know how to enter the borderlands of the felt sense, we prepare the ground for intuition to strike. When it does, we gain unexpected insights that can manifest as fresh articulation and action. In Focusing we break into partnerships, with each partner taking turns Focusing and listening. The listener’s job is simply to be present and by their presence to hold a space for the other person to explore their felt senses and chosen issues. It is not the listener’s job to “be helpful,” to problem-solve or commiserate or evaluate, but simply to be mindfully present, including being mindful of their own felt senses as they arise. The listener also learns how to give simple verbal reflections that help Focusers check if the words they have come up with truly and accurately represent the meaning embodied in the felt sense. When assisted in this way, most people discover that they are able to go to and stay at a deeper level in themselves than if they were ruminating alone. The partners train in both listening to others and listening to themselves. In daily life interactions, the two sides of this equation are equally important. You want to be open and spacious to really hear others; at the same time you are tracking your inner responses and noting when something doesn’t feel right. When you can notice this before you say or do something you may later regret, it is much less likely that you will trigger a negative upsurge in the other person. And because human beings automatically alter their behavior to synchronize with those they are interacting with, the quality of your listening supports the other to be more present, at ease, and authentic. The combination of these three contemplative practices can have potent effects. Practitioners of Deep Listening learn to contact unresolved, stuck, or wounded places in themselves and to hold them with self-empathy. As they contact how the body holds those situations and listen to the body on its terms, they find meaning and wisdom for how each situation wants to resolve itself. The willingness to touch the discomfort makes for a more resilient, more pliable human being, and as we become better able to tolerate and work with the ups and downs in our own lives, we become more skilled in keeping others company as they navigate their own calm or turbulent seas. The practice of Deep Listening cultivates self-listening as the foundation for listening and communicating well with others. Heightened awareness of the subtleties of one’s own body, speech, and mind is the foundation for genuinely receptive, accurate, and compassionate listening and speaking. 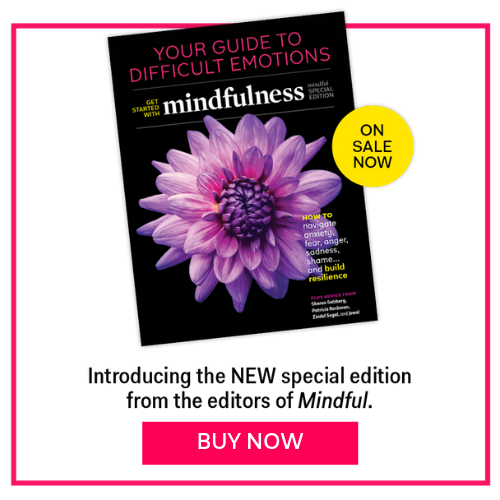 If enough people in our culture can learn and practice these inner skills, a shift from highly dysfunctional to highly functional modes of communication can happen, offering hope that we can enjoy healthier, more fulfilling relationships with the people in our personal lives and all those with whom we share community, country, and planet. As you are reading this text right now, notice how you are in your body. Are you slumping or leaning to one side? Where is your head in relation to your spine? Is it forward, taking your spine with it? Without changing anything, take some time to just be with what you find. Notice your shoulders and arms as you hold the magazine. Do you sense some muscular tension or extra work going on in any part of your body? Shut your eyes and sense the internal quality of the shape you’re in. Do you sense any movement in your body as you breathe? Any lack of movement? What is your state of mind like? Notice all of this with curiosity and friendly regard. Now put the magazine down so that your hands are free but you can still read the text. Feel the fullness of your neck extending up behind your jaw. If you put your fingers in your lower ears and imagine they could touch, that is where your head meets the very top vertebra of the spine, called the atlas. Like all joints, it is a place of movement. Now, sit for a moment without back support on the edge of a chair. Remember where your head meets your spine—between your ears—and, without trying, let go of any tightness in your neck to allow your head to balance easily and with mobility at the top of the spine. The poise of your head is facilitated by dropping your nose a bit to invite a slight forward rotation of your head on your spine. Even though your head is heavy, when it is balanced on its structure—not held or positioned—it floats and becomes weightless. This allows the whole body to respond by expanding and opening. Now as you look down to read, allow your head to tip forward from the top of your spine, not interfering with the fullness and ease of your neck. Notice the quality of that in contrast to the way you were reading at the beginning. Clearing a Space is the first step in the Focusing technique. Its purpose is to clear a space of open receptivity before directing attention to a particular project or issue. It can be done at any time or place and it is especially useful when one is stressed or facing a challenge. First, relax, close your eyes, and bring awareness to your body. Do a brief body scan to notice any places that might appreciate a moment of caring attention. Then become aware of your body as a whole, sensing how it feels to be present and resting on solid earth. Whether we are on a chair, a cushion, or on the grass, earth is always there supporting us: trust it and relax. See if you can find a level of simple presence—a sense of basic well-being that is always there regardless of life’s ever-changing textures. This is like clearing a workspace on a messy desk, knowing the papers you file away will be there when you are ready to attend to them. You may find it helpful to imagine actually placing each concern you find somewhere outside of your body. With these out of the way, rest in a sense of deep calm and receptive openness until it feels right to move on. Hope Martin has taught Deep Listening for ten years with David Rome. She has taught the Alexander Technique since 1987 and has a studio in New York City. She’s a teacher in the Shambhala Buddhist tradition.